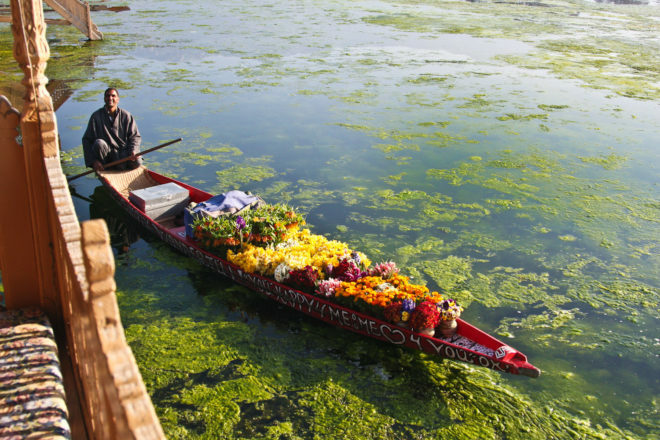 A flower seller on Kashmir's Nagin Lake. Khyber Himalayan Resort and Spa, Kashmir. The name says it all on this colourful shikara. 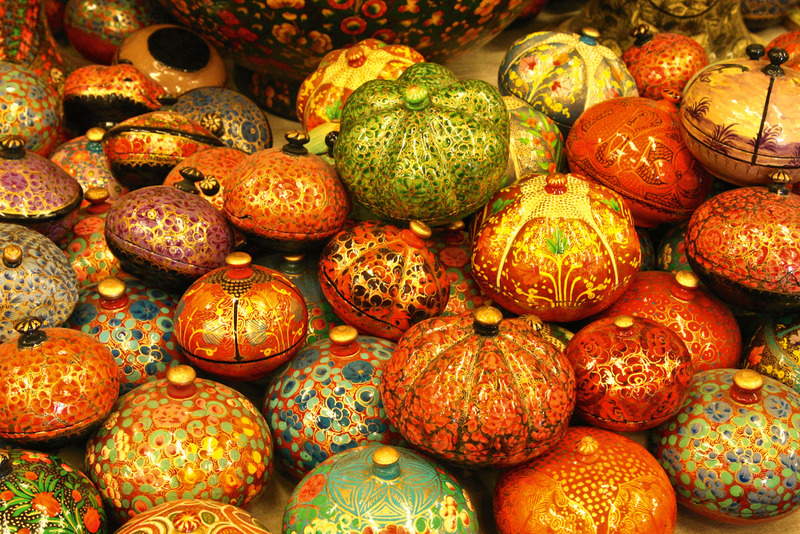 Kashmir is famous for its papier-mache trinkets. Sunset on Dal Lake, Kashmir. A Royal Houseboat on Dal Lake. Eco-luxury Sukoon houseboat has broken the mold of traditional decor. Traditional houseboats come with a decorative back verandah deck, as seen here on Nagin Lake. 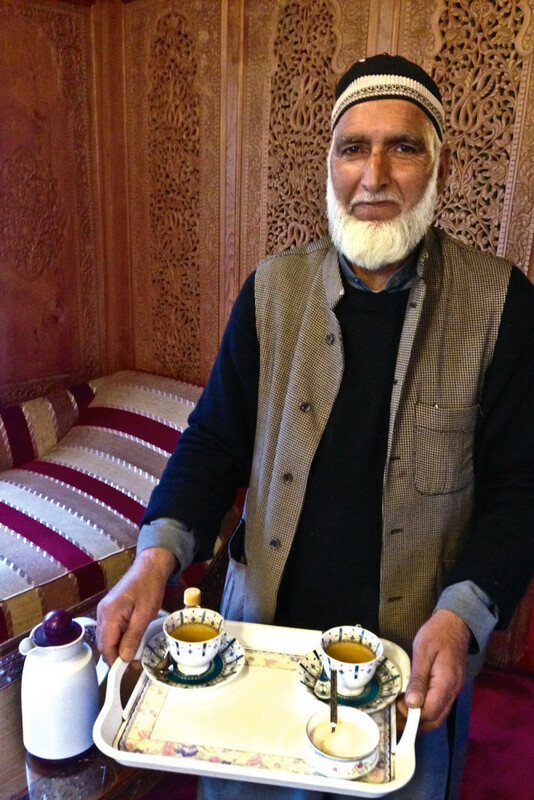 Moqbool serves Kashmiri tea on Gurkha Houseboat on Nagin Lake. Once dominated by turmoil and unrest, Kashmir is one of Earth’s most colourful and intriguing travel destinations, best explored by houseboat. Words and photography by Tricia Welsh. It’s the crack of dawn on Kashmir’s Dal Lake. The muezzin call to prayer echoes around the floating neighbourhood. Ducks quack as we silently glide by and the only movement is the gentle ripple of the shikara-wallah’s oars in the mirror-like water. We have risen early to witness the lively floating produce market a few minutes’ boat ride from our houseboat. Traders wearing crocheted skull caps and full-length woollen farins squat on the front of their long narrow wooden boats that are laden with homegrown produce to sell: carrots, melons, cucumbers, tomatoes and green leafy hak, a favourite vegetable of locals. Business is conducted in hushed, friendly tones as they deftly manoeuvre boats, check and weigh produce, and exchange bags of vegetables before their customers disperse with their purchases as quietly as they arrived. This peaceful pocket in the state’s capital of Srinagar belies the turmoil the Kashmiris have lived with since partition in 1947. The far-flung, north-west Indian state has long been at the centre of disputes between India and Pakistan and, indeed, China. Closed to visitors for 15 years from 1989 to 2004 due to violent unrest, the region has started opening up again in recent years with travel warnings from Britain’s Foreign Office changing from ‘No-Go’ to ‘Proceed with caution’, and the Australian government’s advisory being changed from its direst warning ‘Do Not Travel’ to the less severe ‘Reconsider your need to travel’ for the cities of Jammu and Srinagar. The tourism sector is quietly gearing up in readiness. Houseboats that had completely shut up shop and had their furniture stored for 15 years with hopes “to survive till the good times come around again” are now being spruced up. 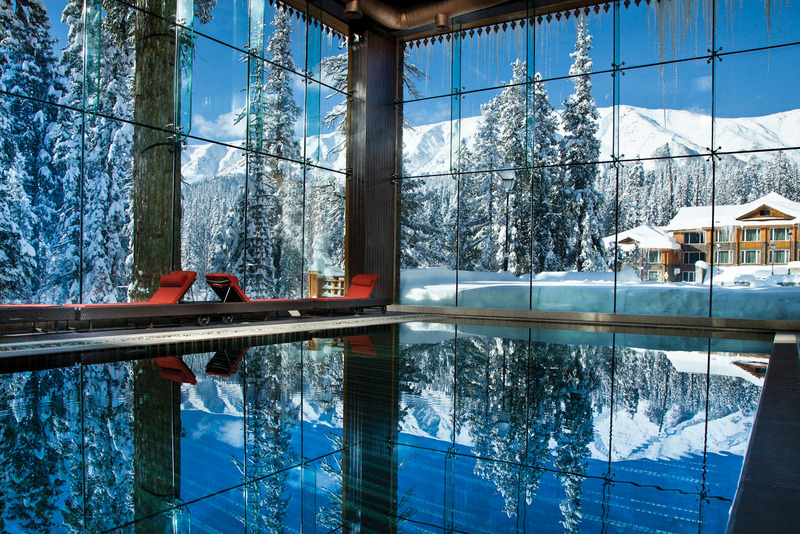 Luxury hotels are opening, like the chic five-star Vivanta by Taj overlooking Dal Lake and the luxury Khyber Himalayan Resort and Spa, a member of the prestigious Small Luxury Hotels of the World, in India’s premier ski fields at Gulmarg, just a 90-minute drive from here. 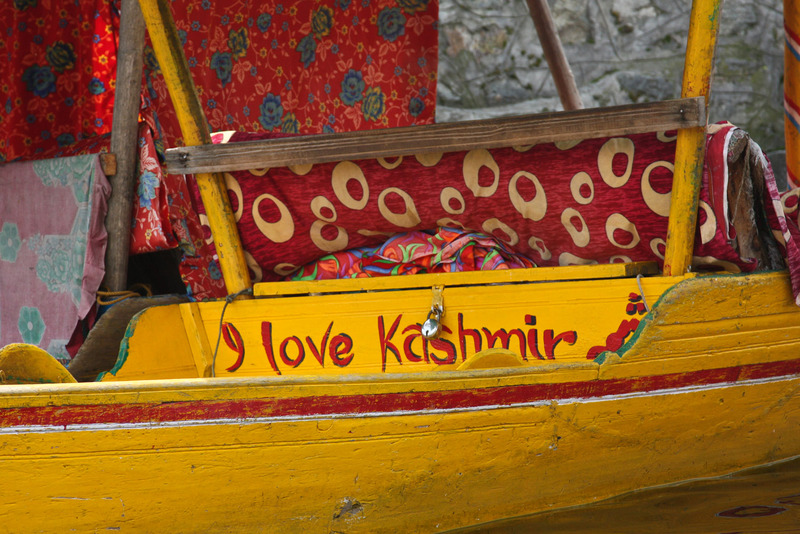 Just the name Kashmir evokes a sense of mystery and seclusion – a touch of the exotic. Ever since Beatle George Harrison retreated to the languid waters of the celebrated Dal Lake in 1966, Kashmir and the mythical-sounding Vale of Kashmir have conjured up images of attainable peace and lofty enlightenment. The flight into Srinagar is over endless snow-covered mountains, slashed with valleys patchworked with apple orchards in spring blossom and acid-yellow mustard fields. On arrival, the scene seems anything but peaceful, with rifle-toting military edging the runway and airport security that appears to be at least double that of anywhere else. But, in a way, it’s reassuring given the delicate political situation and the proximity to neighbouring country Pakistan. My travelling companion and I are met by Javid and Anil who are to be our personal driver and guide for the following week. Both are chatty and willing to talk about the situation. Kashmiris consider themselves neither Indian nor Pakistani and would love independence. Despite the obvious military presence, life seems to go on normally here. We drive past woodworkers carving intricate doors and panels, carpet-weavers, pashmina shops and strings of small businesses en route to Dal Lake where a plethora of houseboats are moored and colourful shakiras or water taxis ferry passengers to and fro. Ever since my much-travelled brother-in-law visited Kashmir in the ’70s and described the Vale of Kashmir as simply “the most beautiful place he’d ever seen”, the region had been high on my wish list of places to visit. But with the political situation not improving over the years, the opportunity to visit seemed very slim indeed, until now. 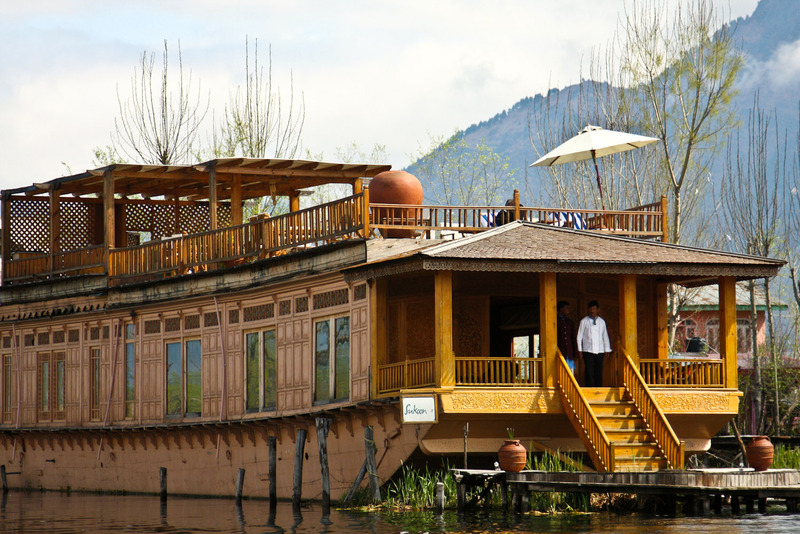 Any stay in Kashmir should involve at least a few nights on a traditional houseboat. The locals have this down to an art form – they’ve been doing it for several generations now, capturing the essence of the Raj era when the colonial English made this type of holiday popular. 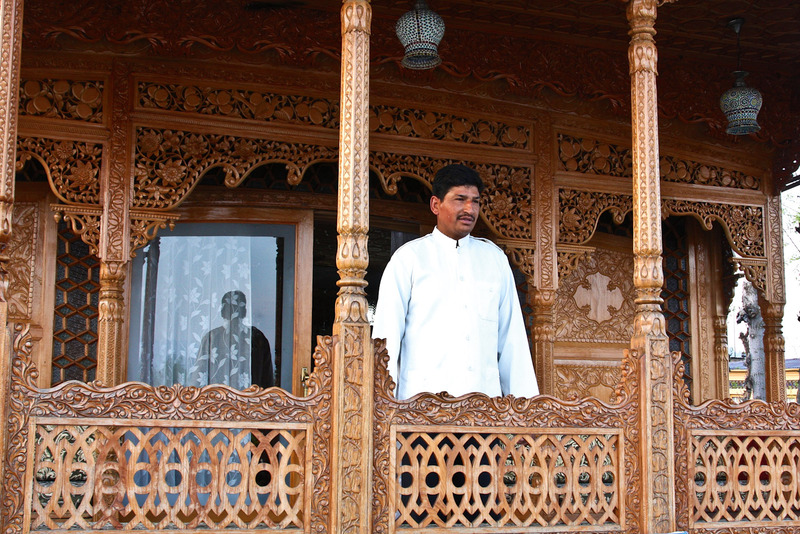 At the time, the Brits were not allowed to own land in India but they got around this in Srinagar by building houseboats, which they fitted out with exquisitely carved walnut or cedar panels, decorative khatamband ceilings, locally made Kashmiri carpets and glitzy chandeliers – tying them up together in small neighbourhoods like clusters of holiday houses. It was while staying on a houseboat on Dal Lake that George Harrison learnt to play the sitar from maestro Ravi Shankar; the floating holiday became the inspiration for his song Within You Without You on the Sgt Pepper’s Lonely Hearts Club Band album and prompting a huge influx of backpackers to this remote corner of India in the ’60s and ’70s, putting it firmly on the hippy trail. It is estimated there are 4000 traditional houseboats that vary from funky to fabulous, with quirky names such as Cheerful Charley, Cherry Ripe, Fair Heaven, Pigeon and even Rolls Royce. Highly recommended is the group of well-positioned Royal Houseboats on Dal Lake, the welcoming Gurkha Houseboats on nearby Nagin Lake, and the stunning eco-luxury Sukoon, which has had a major refit and facelift to offer air-conditioned luxury accommodation with modern western-style bathrooms, silk furnishings and a rooftop lounge and dining area under market umbrellas. We check into the Crystal Palace, a typical traditional houseboat and one of six Royal Houseboats permanently anchored on Golden Island, a quiet arm of water away from the main thoroughfare. Built in 1979, it is made of local cedarwood with intricately carved fretwork adorning the front verandah area, where our smiling white-jacketed houseboy welcomes us with the first of endless cups of fragrant kahva tea served in a gilt-rimmed tea set from a bygone era. Comprising green tea leaves, cardamom, cinnamon and saffron, Kashmiri tea smells like Christmas in a teacup and is great for digestion. Inside, thick carpets are overlaid with decorative locally woven rugs, and there’s a mish-mash of richly carved walnut furniture, old-fashioned chintzy sofas and chairs, heavy embroidered curtains and a vase of cheery daffodils – all lit with myriad incongruous chandeliers. Beds are piled with mismatched quilts and blankets, and the bathroom is cheap motel-meets-rustic cabin. But it’s all spotlessly clean, and everything is done with grace and a permanent smile. Most houseboats offer full- or half-board with three to five ensuite bedrooms, a shared living room, dining room and a cushioned front verandah deck. If you have enough friends you can take over the whole houseboat. Guests usually dine en famille around one large dining table – like going to a private dinner party every night and making new friends. The food served is simple, honest, and often home-cooked Kashmiri chicken or lamb casserole-style dishes that arrive in thermal plastic containers. A popular Kashmiri dish for dinner is chicken yakhni with cardamom, cinnamon and mint cooked in yoghurt. A typical lunch might be tomato soup and toast followed by grilled chicken with rice, carrot, cabbage, potatoes and peas, and perhaps fruit to follow. Later, we are transported by private solar-powered motorboat to Sukoon, which is more like a small boutique hotel than a houseboat, with a staff of nine to service five rooms. Built in 1979 by the father of the current owner, savvy hotelier Altaf Chapri, it has emerged triumphant from a massive refurbishment to offer the most luxurious accommodation afloat. 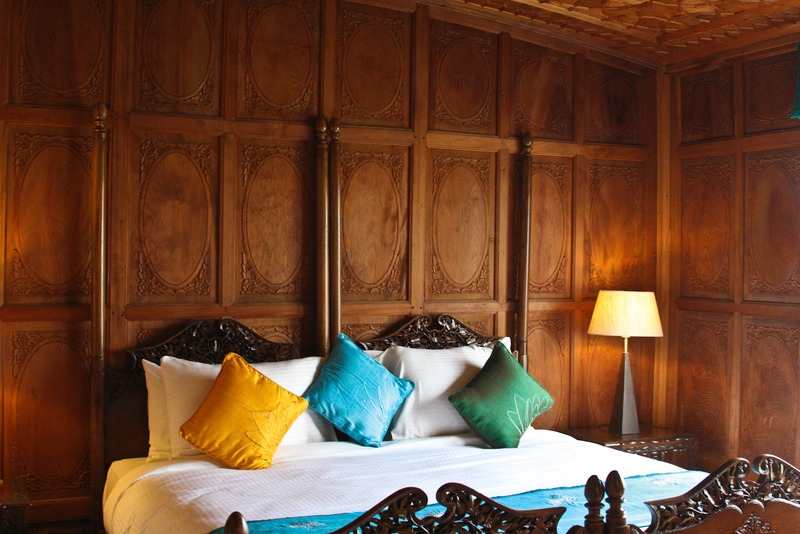 Furnished in sleek lines with polished pinewood floors, it features just a few Kashmiri rugs, traditional carved panels and furniture enhanced with aqua-, watermelon- and mango-coloured silk cushions and blinds. Bedrooms are elegantly furnished; the spacious bathrooms have a bathtub, separate glass-enclosed shower, knotted pine floors, white walls and modern fixtures – it is almost Scandinavian in feel. Guests have their own dining table; resident chef Deepak Kumar Rai comes out in his chef’s whites, complete with toque, to consult guests on the menu. He serves authentic Kashmiri and Indian cuisine with an innovative twist, elegantly and artfully presented. And the large furnished rooftop deck and bar is the ideal place to kickstart the day with breakfast while enjoying unsurpassed views over the lake through to the Pir Panjal mountains in the distance. 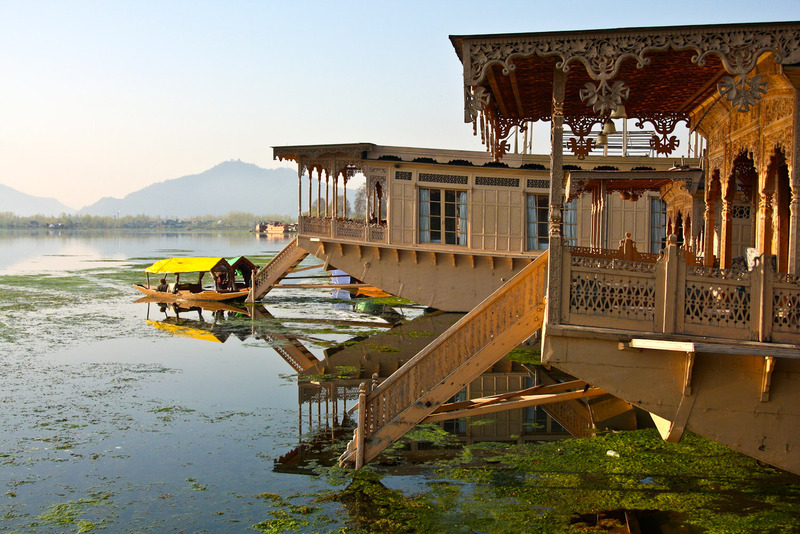 Life on Dal Lake revolves around the water with floating shops, workshops, mosques, schools and the famous floating gardens made from bulrushes filled with azolla weed and other lake seaweed, which is harvested by twisting it like giant spaghetti around long bamboo poles. The gardens have been a feature of the lake for more than 500 years and can be towed around at will. In winter, when temperatures plummet to -6 degrees Celcius, the lake freezes over and children can skate or walk on the frozen surface. If you can tear yourself away from the mesmerising pace of life on the water, Shalimar Bagh, the Mughal gardens with cascading terraces and water features, is worth a visit. Built by Mughal Emperor Jahangir for his wife in 1630, the gardens later became a pleasure place for Pathan and Sikh governors. Srinagar’s Old Town, with its Central Asian architecture, emanates from the exquisite historic Khanqah Shah-i-Hamadan mosque that honours the Persian sultan who brought Islam to the region and is also credited with introducing Persian crafts and the art of carpet-making in the 14th century. Nearby, market stallholders sell dozens of spices, dried fruits and nuts, stacks of bread, homewares, and meat and poultry at primitive roadside stands. The drive east of Srinagar to Pahalgam, a popular mountain resort, is through the fertile 130 kilometre-long Vale of Kashmir which, although surrounded by year-round snow-capped mountains, enjoys a temperate climate. It produces exceptional apples, mulberries for silk production, walnuts, prized saffron and handmade willow cricket bats, which are sent all over the cricket-mad country. From the comfort of your cushioned houseboat verandah, you can watch the world go by: children rowing home from school, floating shops selling sweet treats, merchants hawking their wares, men harvesting weed from the lake while listening to the haunting muezzin call as the sun sets over Hari Parbat Fort in the distance. It’s hard to imagine anywhere more romantic and serene, away from the crowds and any hint of the hostilities of the past. As an inscription by Emperor Jahangir on a pavilion wall in the Shalimar Bagh gardens suggests: “If there is a paradise on the earth, it is here; it is here; it is here”. Kashmir is in far north-west India abutting Pakistan and China. 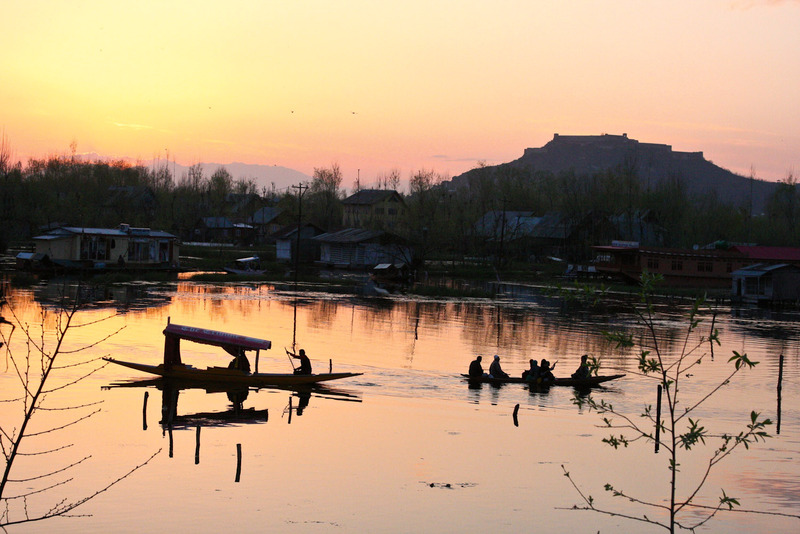 The capital Srinagar is surrounded on three sides by magnificent soaring peaks including the Himalayas. The best time to visit Srinagar is between June and September, although April is the best month to view the thousands of tulips in bloom in the famed Indira Gandhi Memorial Tulip Garden. Tricia travelled with Holidays in India, which offer an eight-night package to Kashmir on full-board basis (except in Delhi) that includes two nights in Delhi, return domestic flights between Delhi and Srinagar, one night on a Royal Houseboat, one in Pahalgam, another in Gulmarg and two nights on the eco-luxury Sukoon houseboat from $1506. A sense of adventure, layers of clothes, an umbrella and puffer-jacket. Consider taking your own duty-free alcohol as Kashmir is virtually a ‘dry’ state with little beer to be found and poor-quality wine. Brightly coloured papier-mâché trinkets, boxes and homewares, fine pashmina shawls, handwoven Kashmiri carpets, highly prized dried saffron from Pampore, crewel-embroidered bedspreads and cushions.